This post has been rattling around in my mind for almost a year now. But the timing has never felt right, the words have never come, and I've felt incapable of sharing something that has so much tender + raw emotion attached to it. However, the longer I go without writing it, the more I feel the nudge to do it. So here we go- these are my personal feelings + experiences. And while some may feel it is not the path they would take, my hope is that it sheds some light on how loving those with different lifestyles is life changing. These days, almost everyone has made up their mind about how they feel about the LGBTQ community. I'm a firm believer that everyone is free to have their own opinions about this kind of thing. In my case, although I had some religious beliefs that influenced my general feelings, I had never really taken a stance on the matter... because quite honestly I didn't need to. However, I have always tried to lead with my heart, and I believe that loving, not judging, is our only responsibility. In 1999, I became a big sister. My parents brought home a sweet baby boy from the hospital and told me his name was Dylan. He had bright blue eyes + blonde hair and I think I fell in love with him the minute I saw him. As he became a toddler + later a child, he would run after my sister and I, always excited to join in on the fun. He was the center of attention. He had a squeal for a laugh that was contagious + joyful, and a voice as scratchy as an old record. Oh how I loved him. As he grew up he became an inquisitive, soft-hearted, brilliant, and loving brother. He loved bugs, played sports, loved camping, and playing games. He grew taller than me + I soon found out he was stronger than me too. We've always been close + would spend hours talking about what we wanted our lives to be like. 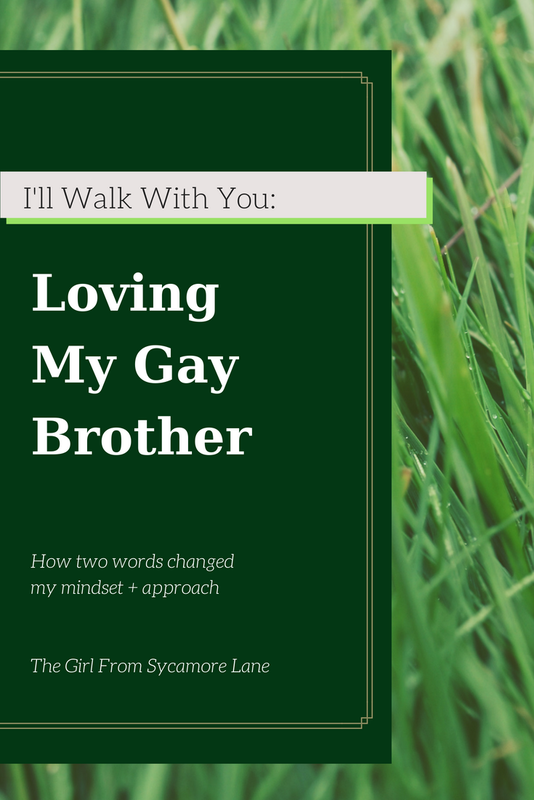 I found out that my brother was gay the week after I got married. For several moments I didn't know how to feel. Now, I have to be honest here + hope that feelings are not hurt. I believe that all humans are children of God, and that His love is unconditional. It is my belief that God does not desert his children - and never will. I believe that he has a plan for us, and desires that we make choices that will lead us back to him. I also have come to believe that these people who come out as lesbian, gay, etc. are often born with these struggles; they do not choose it. As firm as my beliefs are, I also have beliefs that sometimes make things a little blurry. 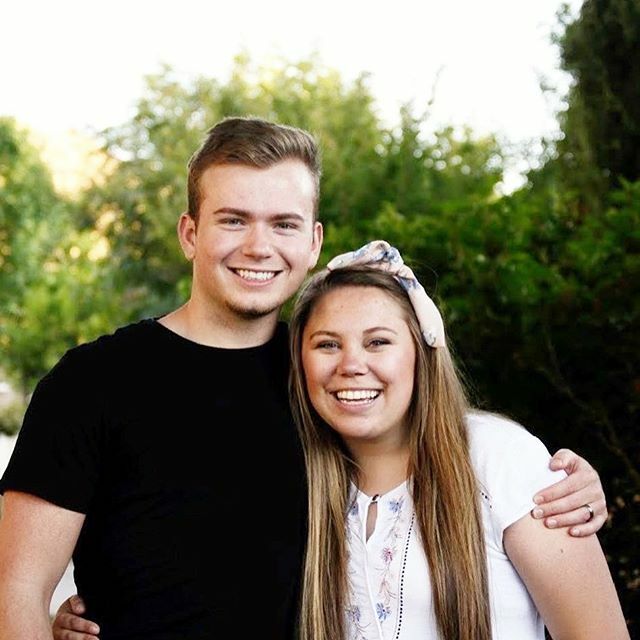 I don't think I need to go into the details, but simply put, as a member of the LDS church, there are certain things I believe about marriage + the family that suddenly weren't so cut and dry with a gay brother. So when I found out, I felt surprised + shaken, and a little out of sorts. For a brief moment, I felt extreme sadness + confusion. In an effort to find some peace, I quickly said a silent prayer and asked my Heavenly Father one sentence: "What can I do?" My answer came immediately. "Love Him". Quite suddenly those uneasy emotions quickly transformed into feelings of immense love for my brother. I thought back to several instances in the past + suddenly everything clicked; it was like I was seeing my brother for the first time. Sure, I had lived with him my entire life - but for the first time I was able to see life through his eyes + really see HIM. I realized the struggles + heartache that he had gone through, and my heart broke for him. All I knew is that I wanted him to know I would be there for him. 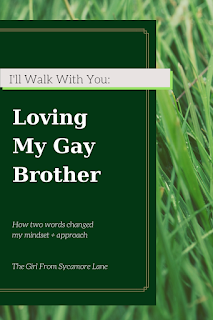 My brother had not yet decided to come out, not even to me or my siblings, and I wanted to respect his timing. So, for the next year I worked to make sure he knew I would love him + accept him if and when he decided to come out. I won't lie, there were days when this was easy, and days when this was very difficult. I need to add that there has never been a day that I have stopped loving my brother - and there never will. However, there were days when I was completely heartbroken + grieving. When I cried + cried + couldn't find peace. As much as I loved my brother, there was a lot I was trying to understand and learn. My parents were a great resource, as they had known for some time + had already come to understand a lot more about my brother. Yet, I still needed something or someone else to help me know how to best accept + support my brother. He had started to come out to a few friends, and my guess is that others started to suspect it as well. I loved my brother so much that I wanted people to look at me + know that I loved him + accepted him. I wanted to be an example of how to treat him so others would follow suit. In an answer to prayer, I read a book that changed my life. It's titled, "That We May Be One", and is written by Elder Christofferson's brother, Tom. It offers his perspective on faith + family as a gay mormon and it has taught me + inspired me so much. One of my favorite sections comes from Tom's mother, speaking to her grown children. "The most important lesson your children will learn from how our family treats their Uncle Tom is that nothing they can every do will take them outside the circle of our family's love". After reading this section, I knew I had found my peace + direction. I knew that part of my duty as a sister was to let my brother know that nothing could take him outside the circle of my love. It's taken work, it's taken patience. It's been hard, it's been easy. But bottom line, it's been worth it. Since then, my brother has come out fully to me + knows that colten + I are here for him, no matter what. Though I haven't always known the battles he's been fighting, I try hard to help be there for the ones he faces now. His strength is amazing + inspires me. Dylan met a wonderful guy named Paul who is so kind, genuine, and loving. They got married in the fall + have moved to Italy while Paul works there at the air force base. They are happy + we are so happy for them! Seeing my brother with someone so wonderful is all I could ask for. Life is so good, and I feel so blessed to have him as a brother. He has taught me how to love, how to be yourself, and how to chase your dreams. How grateful I am for tender mercies + help from heaven in navigating the last couple of years. For those interested, "That We May Be One" can be found here.